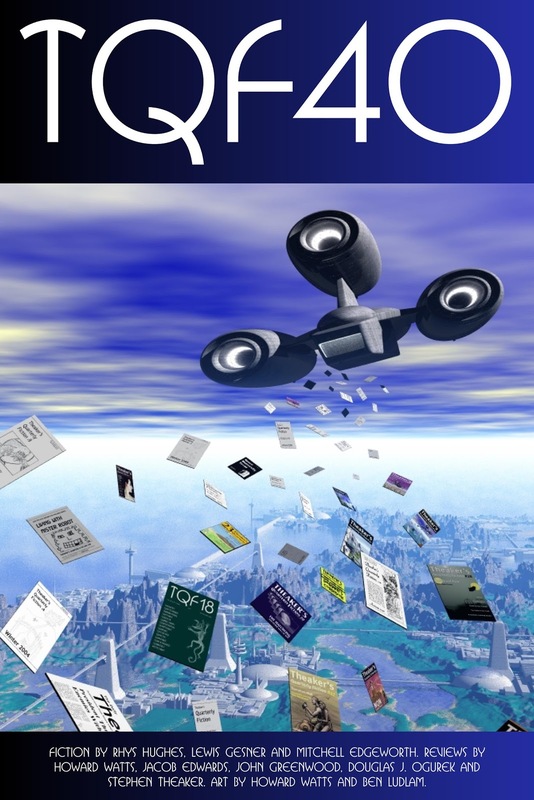 Theaker's Quarterly Fiction #40 – now available for free download! It's springtime! Don't you deserve to be happy? Then download issue forty of Theaker's Quarterly Fiction – or buy a print copy if you're so inclined! This issue features our last seven micro-fictions from Rhys Hughes in “The Delusions and Tangents of Thornton Excelsior”, Lewis Gesner's strange little fable “The Journey of Toil Ling; a Folkish Tale”, a man coping with memories of off-world troubles in “Homecoming” by Mitchell Edgeworth, and thirty-odd pages of reviews by Stephen Theaker, Howard Watts, Jacob Edwards, John Greenwood and Douglas J. Ogurek. Cover art is by Howard Watts and interior art is by Ben Ludlam. I've been extraordinarily busy with work this month, so (a) I'm really sorry for this issue being a month late and (b) additional apologies if my tired eyes missed anything while proofreading it last thing at night. I'll be giving it another read next month and will hasten to correct any mistakes I find. Hope you like the new cover design! BEN LUDLAM is an artist from the wastelands of County Durham. See http://banthafodder.deviantart.com for more of his work. To this issue he contributes the stunning illustration for Rhys Hughes’ sub-story “The Juice of Days”. DOUGLAS J. OGUREK’s work has appeared in the British Fantasy Society Journal, The Literary Review and Dark Things V (Pill Hill Press). He has also written over fifty articles about architectural planning and design. He contributes a review of Chronicle to this issue. He lives in Illinois with his wife and their six pets. HOWARD WATTS is an artist from Seaford who provides the celebratory cover to this issue, as well as an in-depth review of Elder Scrolls V: Skyrim, which has rather been taking over his life. (I learnt my lessons from games three and four in that series, and now stick to safely non-addictive games like The Adventures of Tintin and NCIS: the Game.) He has previously provided covers for Pantechnicon, Dark Horizons and TQF. 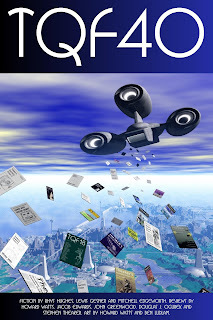 He has also provided the first cover for Fantasy Short Stories. Check out his page on Deviantart. JOHN GREENWOOD is among us. In this issue he reviews Crimewave Eleven: Ghosts. LEWIS GESNER is an American writer and artist, living in Taiwan. He publishes, exhibits and performs internationally, and is a member of Mobius artist group in Boston, MA, USA, currently on leave. His book In the Shadow of the Still Hosts is now available from White Sky Books. MITCHELL EDGEWORTH is a 23-year old writer living in the western suburbs of Melbourne, for his sins. His first short story, “The City”, was published in the Autumn 2011 edition of the Battered Suitcase. Find more of his writing here: www.grubstreethack.wordpress.com. STEPHEN THEAKER is the eponymous co-editor of Theaker’s Quarterly Fiction, and writes many of its reviews. His work has also appeared in respectable publications like Interzone, Prism, Black Static and the BFS Journal. All thirty-nine previous previous issues of our magazine are available for free download, and in print, from here. What is it about dreams that makes them so hard to remember later? For a start, they're not easily woven into the story of one's waking life. Every night the mind channel-hops to the murkier end of the EPG where you’ll find a mixture of repeats and experimental drama before normal service is resumed the next morning. What was that mad foreign film I was watching last night? Wolf Maggots was it? Can't quite recall. Never mind, back to the 24-hour rolling news and travel. Partly it is the anarchy of dreams that induce rapid forgetting. They're notorious for ignoring well-established rules of physics. How come that dog could levitate? Well, I was wearing my brother's sweater in the dream, which seemed to explain a lot. It's also clear that your unconscious mind has never read Writing Fiction for Dummies. I was back at my old school, only it wasn't anything like my old school, but somehow I knew it was, and then we reached the edge of the forest. Cavernous plot holes and smeary ellipses abound, while on the other hand inconsequential conversations are dwelt on at unseemly length. 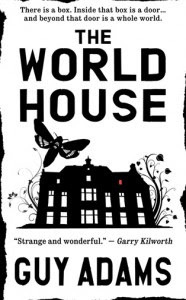 The World House is an extra-temporal dwelling which relies on human nightmares for content-provision. Partly because of this, Guy Adams's novel suffers from these memorability problems. To be fair, the plot is pretty tightly sewn up: a handful of disparate characters from various (but mostly English-speaking) locations and historical points in the last century or so, come into contact with an exotic, impenetrable wooden box. When these circumstances coincide with their being placed in mortal danger, they are plucked from their native time and place and dumped, apparently at random, somewhere in the house. We then follow each group of abductees as they try to survive animated taxidermy, giant snakes and ladders and assorted bizarre threats. Adams splits them into small groups who battle and quarrel their way through the maze of rooms (although some of the rooms turn out to be mountains or oceans), and the side-effects from one chapter cleverly inform what is happening to characters in another part of the house (removing a giant bath plug saves one group while imperilling another who are climbing through the drains). In a very effective, cinematic climax, a railway station is generated from of the imagination of a little girl, the trains designed to take passengers back to their respective times. Adams has a neat trick of reintroducing characters into the action so that you don’t immediately recognise who you’re dealing with, and the realisation can be startling. All the same, we don't really find out enough about the reason for the house's existence, or why is has to take the form of embodied dreams at all. I'll try not to spoil it, but some non-human agencies have been making mischief: their powers and motives are dealt with in a few colourful but hand-wavey interludes. I'd rather have learned more about the relationship between house's human inhabitants and its god-like designers, and spent a little less time watching the characters bicker and chew the fat in the downtime between fighting for their lives. Even if real people do sometimes discuss their breakfasts at tiresome length (and I've worked in offices where the subject can take up most of the morning), if that meal is not going to play a vital role in future events then perhaps we should not waste time eavesdropping on such exchanges. The plot of The World House has the linear feel of a particular type of puzzle-based role-playing computer game. Typically a group of characters find themselves trapped in a room without any apparent exit, but faced with imminent death at the hands of (say) a cannibalistic chef, or a swarm of killer moths. After a hard trial they discover a hidden exit, only to find themselves similarly threatened in the next room. Some of the threats are mind-bending (an indoor mountain, from the top of which one can still make out the cornices in the ceiling), but the arbitrariness and omnipotence of the house and its dangers pall after a while. "Anything's possible" is sometimes a recipe for imaginative slackness. As in poetry, it's the restrictions themselves that fuel innovation. One central conceit, which I feel could have been given more space, is the library, a vast hub in the centre of the house where the biographies of every human being, living or dead, are all written, or still in the process of writing themselves (clear echoes of Borges's “The Library of Babel”). The characters find their own biographies (rather too easily, I thought), and this plays a key role in the story, but I found myself wondering how the biographies of Australopithecus would read. Would there be a cut-off point, beyond which the library would disdain to describe the pre-linguistic gruntings of bipedal apes? The characters Adams introduces us to are from a much smaller range of historical time. Roger Carruthers is an Edwardian explorer (we're not given his exact date of abduction, but he does mention Roald Amundsen as a contemporary), and seems to be the earliest, although he is a pantomime gallant Colonial. Oddly, given the house's unlimited reach through time, there are no characters buzzed in from the far future, but further developments in the sequel Restoration, may well shed light on this. Tying the house to the mysterious box is a clever way to restrict entry to this club, but the one character who does not speak English as a first language suffers a lack of depth. A sincere, hard-working fisherman's son from Civil War era Valencia, Pablo's language skills peak and trough from one sentence to the next. The other characters (a jive-talking alcoholic pianist from the 1970's, the stripper he's in love with, a social butterfly from the 1920's Harlem, a bunch of stranded sailors, each with their own, singular character trait) are distinguished mainly by their verbal tics. She moves on to the cutlery, making sure that there are forks then knives then spoons (this is the order in which you use them unless you have soup but soup has its own type of spoon, not like these, so it's still all right). She makes the forks and spoons sit inside each other so they are one stack of each. She cannot do this for the knives but she can make sure that all the blades are pointing the same way. This makes them look better. They are not all the same type of fork, knife and spoon so it will never be perfect but it will Just Have to Do. She is not always good at Just Have to Do (however much her mother tried to teach her how it worked) but she does her best. She realises that this means that her trying to make Just Have to Do work is a good example of Just Have to Do. Life is funny like that. She understands it a bit better for the realisation. Sometimes nearly is the best you can get. Yes. This is an important thing. Just Have to Do. A wise thing. Passages like this stand out because they capture somebody's inner voice and inner conflicts. They're not trying only to be funny, but they are amusing all the same. He was damned if he was going to cower in fear of what sounded like an asthmatic terrier. …having had his reproductive organs shunted to just below his lungs. Welcome to bloody Narnia, Miles...Hope you remembered to pack the Turkish Delight. Within ten minutes they were walking again, trudging up the snow-covered steps, the peak of the mountain drawing closer at a speed normally reserved for indolent bricks. It's not that I'm opposed to humour in adventure novels, it's just this compulsion to try and drag a joke out of everything. If you find the above quotes funny, then you'll probably love this book to bits, but try this: read them in your head in the voice of Jeremy Clarkson, then tell me they're still good.